This video and the following video will take you through the steps for naming aromatic compounds using their common names, as substituents off larger molecules, and as a parent molecule using ortho / meta / para. 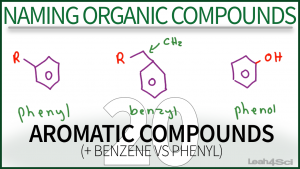 This is Video 20 in the Naming Organic Compounds Video Series. Click HERE for the entire series. Mam you’re work is truly commendable. I was so frustrated about organic chemistry but then came upon your videos on youtube. You restored my faith in how a good teacher can completely change a student’s approach. Thank you so much! My pleasure! I’m happy to help! Thanks Leah4sci- coming from someone who has no science background, these videos were the best i’ve watched. So clear and move at a good pace. Thank you thank you thank you!!!! !